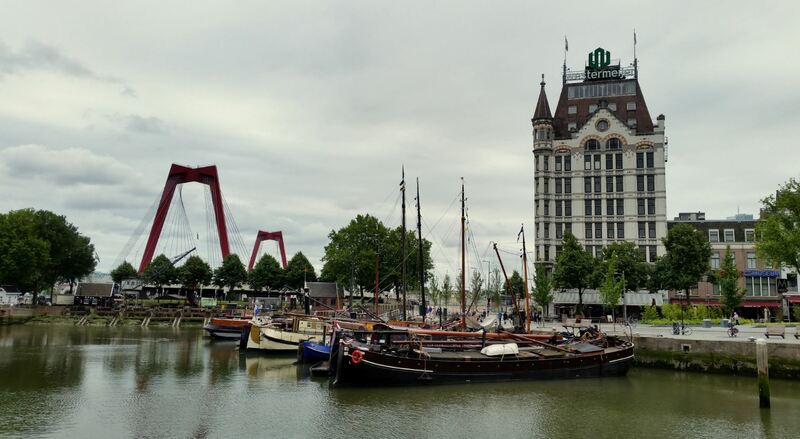 While the weather forced us to cancel our plans to visit Kinderdijk and Rotterdam last year, during this visit the weather was a bit more favourable and we were able to spend a few dry hours in Rotterdam, giving us enough time to finally visit the new Market Hall. The Market Hall, Markthal or Koopboog in Dutch, was officially opened on October 1st 2014 by Queen Maxima of the Netherlands. 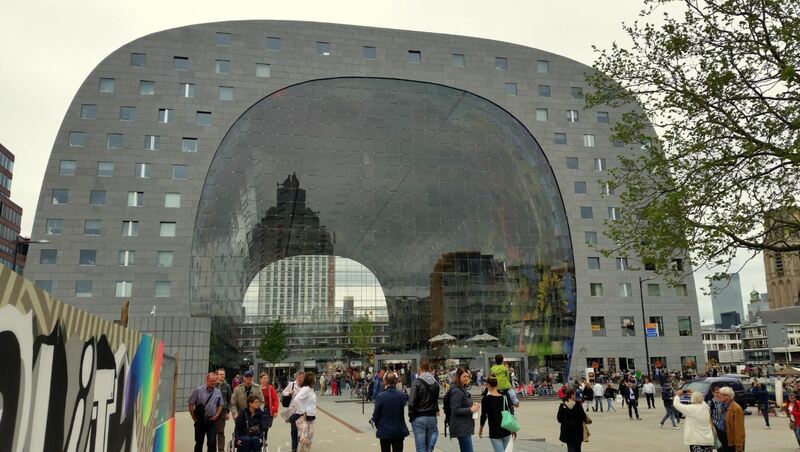 The building was designed by MVRDV, a Dutch architectural Office, in the form of a horseshoe. It comprises the large market hall, 228 apartments, a large retail space, cafés, bars and restaurants. Underneath is a huge underground parking garage. The inside of the Market Hall is covered with a 11.000 m2 artwork of Arno Coenen, named Horn of Plenty (Hoorn des Overvloeds). 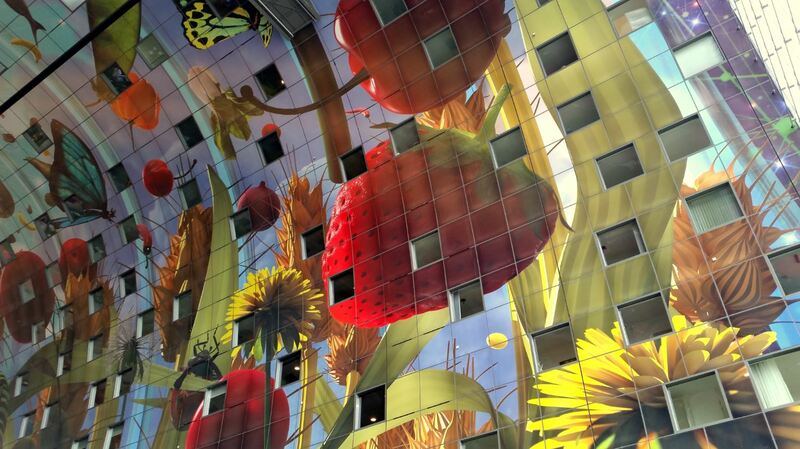 The artwork, by some called the largest artwork in the world, shows enlarged fruits, vegetables, seeds, fish, flowers and insects. Across from the Market Hall are the famous Cube Houses. 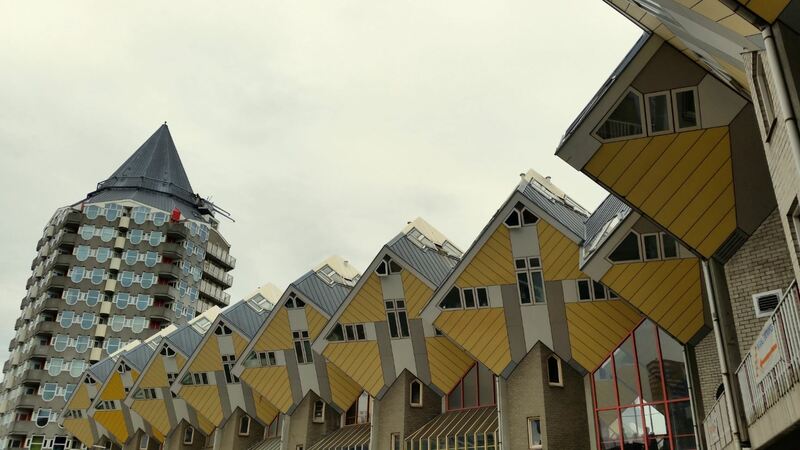 Designed by Piet Blom as a village within the town, the individual cubehouses can be seen as a tree(house), all the houses together as a forest. The complex is actually a pedestrian bridge crossing a busy street.